With HMI light bulbs, you are able to simulate natural daylight even if it's pitch-black outside. These lamps are excellent for film, TV, video and stage use, and are exceptionally bright, lightweight and cool for safe use during long shoots. So what is HMI lighting? HMI stands for hydrargyrum medium-arc iodide, and signifies a type of bulb or housing that produces efficient, daylight-balanced light running at around 5,600 Kelvins. At BarnDoor Lighting Outfitters, we have HMI lamps in a wide variety of styles, wattages and color temperatures for quality lighting anywhere, anytime. Shop our broad selection of HMI 5600K daylight bulbs to help you find the HMI lamp you need to recreate natural sunlight indoors the professional way. We carry HMI bulbs for par lights, open-face lights, fresnels and more. Choose single-ended HMI globes for your par lights, or shop double-ended HMI lamps. 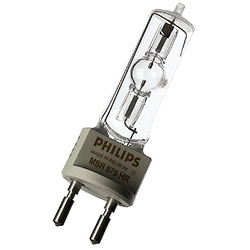 Some of these high-tech HMI light bulbs are manufactured with a special UV-coated glass envelope to protect from UV rays, while some have built-in hot restrike igniters to allow you to turn them on right after they have been turned off. BarnDoor Lighting is always on hand to answer your HMI bulb questions. Reach out to us by phone at 1-888-276-3667 or by e-mail at info@barndoorlighting.com.